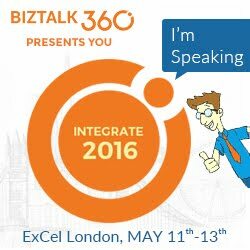 The BizTalk Summit has become an annual, must attend, event in London. 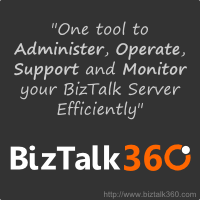 This event is once again being organized by BizTalk360 in conjunction with Microsoft and the BizTalk Product group. BizTalk360 has organized several large events and I expect this one to be even bigger than some of the other events they have hosted including the very successfully Integrate 2014 event they put on in Redmond in December 2014. There have been over 250 attendees registered and you can still take advantage of some discounted tickets being available. This event provides a great opportunity to learn and network with Integration experts from all over the world including Microsoft BizTalk and Service Bus product team members. Please visit this link for registration information. My buddy Sandro Pereira has put together a blog post called Top 7 reasons to attend BizTalk Summit 2015 which I thought was an interesting read. You can take a look at that article here. Recently, some of the BizTalk Summit session abstracts have been posted, including mine, so I thought I would update my blog as my the sessions were not public when I previously announced I would be speaking. My topic is on API Management and more specifically Azure API Management. You can read the details below. Building APIs is not just about technology. APIs enable many new business opportunities, but only if done correctly. As a result of lucrative opportunities, many Software vendors have emerged or pivoted from their SOA management roots to provide API Management capabilities. These API Management platforms provide the building blocks behind a successful API program. In this session, Kent will introduce you to Microsoft’s Azure API Management platform by providing an overview that highlights its capabilities and the opportunities that emerge for organizations. As part of this presentation, Kent will demonstrate how developers can create their first API and discuss strategies for transforming existing services to leverage Azure API Management. This presentation will consist of general guidance on API Management, an Azure API Management portal walk-through and demos that re-enforce the concepts that were introduced. You may be asking yourself – “Part 1” well what is “Part 2”? There will be another session that includes Azure API Management by Tomasso Groenendijk. We have been working together to ensure there is no overlap and he will pick up where I leave off from an Azure API Management capability perspective.